The exhibition signatorius seeks to highlight a historic Israeli iconic symbol that although often unfelt, is still undoubtedly one of the most relevant documents at any given time. We are all familiar with the document. Copies of it are to be found hanging in hallways in schools throughout the country, in the classrooms, in kindergartens, in public buildings, and even in private ones. We pass by it so many times during our life time. If we try and remember, we would maybe be able to quote a phrase or two from it. But who among us has ever read the Megillah (The Declaration of Independence) beginning to end? 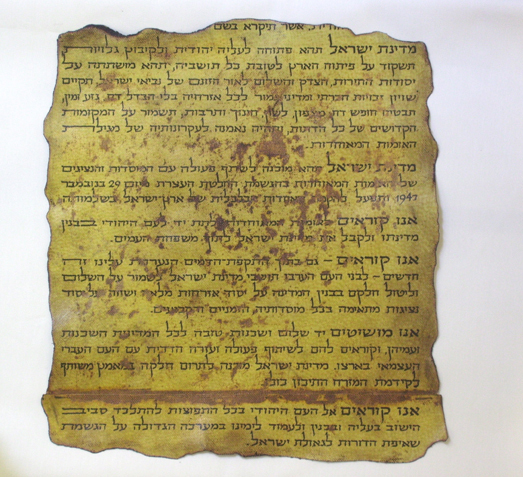 Indeed, this scroll (megillah in Hebrew) is deeply rooted in Israeli symbolism, but it would seem that it functions as no more than an ornament to be hung on walls. Everyone knows that the Declaration of Independence (Megillat Ha'Atzma'ut) serves as the legal corner stone for the State of Israel; but a close study of the text reveals an it is a basis for many interpretations beside legal and constitutional loopholes. 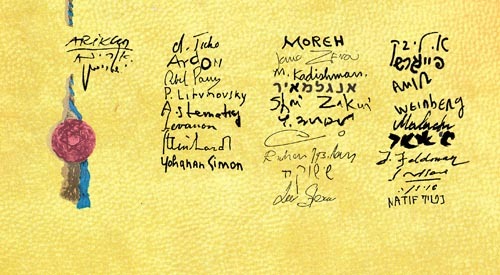 It is interesting to note, that among the leaders who signed their name on the document, one can not find not even a single intellectual. According to Ben-Gurion, the plastic arts have no place in shaping the social norms in the ideal state. We can speculate, that this attitude is the reason that Israeli art is constantly searching for its own identity. Israeli art is a schizophrenic art. It does not really know if its here or there; and despite having scathing criticism and statements, made by its artists, its influence on social processes in the state is insignificant. signatorius displays the works of 28 artists, an analogy of sorts to the 28 signatories of the original Declaration of Independence. The gallery's central space displays works by contemporary re-examining the main parts of the Megillah, while offering their personal interpretation to Ben-Gurion's creed. The inner space of the gallery is designated for the "1948" chapter, including works by several artists considered to be of the founding generation of Israeli art, expressing the nature of the State of Israel in its formative years: a state strongly bound to the Zionist ideal on the one hand, and shirking all local characteristics while looking up to Western culture, on the other.